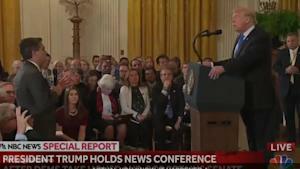 Scroll back up to restore default view.The White House revoked Jim Acosta’s press credentials Wednesday after he had a heated exchange with President Donald Trump at a news conference and an intern tried to grab a microphone from the CNN reporter.“As a result of today’s incident, the White House is suspending the hard pass of the reporter involved until further notice,” White House press secretary Sarah Huckabee Sanders told reporters. Acosta also tweeted that he had been denied entrance to the White House, where he was scheduled to film a spot for CNN, a network Trump has repeatedly targeted as “fake news.” Jim Acosta @Acosta I’ve just been denied entrance to the WH. Secret Service just informed me I cannot enter the WH grounds for my 8pm hit 2:46 AM – Nov 8, 2018 He also shared video of the incident. Election 2018: Here’s a look at Tuesday’s results in Washington state Originally published November 6, 2018 at 10:11 pm Updated November 7, 2018 at 11:01 am Kim Schrier, running ahead of Dino Rossi in the 8th Congressional District, takes to the stage to speak to supporters Tuesday night in Bellevue. (Ken Lambert / The Seattle Times)When the nation’s eyes turned to the West Coast, Democrat Kim Schrier held a 6 percentage point lead over Republican Dino Rossi in Washington’s 8th Congressional District. 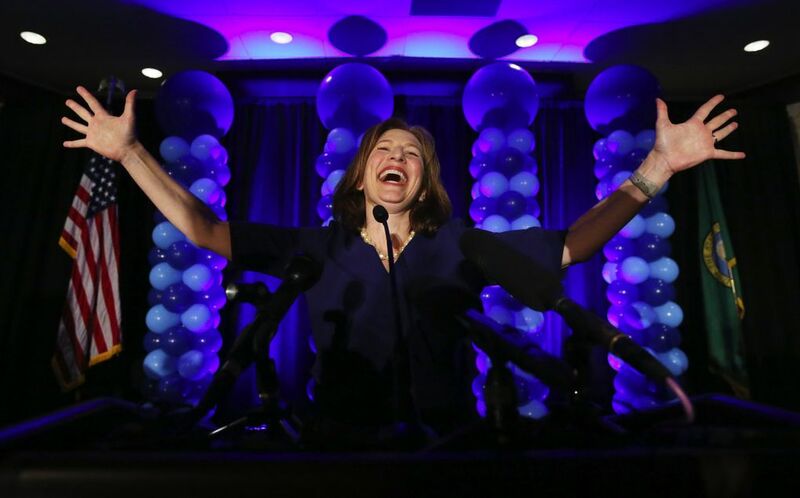 Here’s how the night unfolded.Share story By Sean Quinton Seattle Times metro producer Democrats gained control of the U.S. House of Representatives as results flowed in from across the country Tuesday night. When the nation’s eyes turned to the West Coast, Democrat Kim Schrier held a 6 percentage point lead over Republican Dino Rossi in Washington’s 8th Congressional District.Meanwhile, Republicans kept control of the U.S. Senate, as one of the highest profile races in the country went to Republican Sen. Ted Cruz, who held off Democratic challenger Beto O’Rourke in Texas.So what about that “wave” that everyone was talking about? It turns out, our nation couldn’t decide on one color, columnist Danny Westneat says. Two waves rolled across the nation on election night — a liberal blue wave in the suburbs and a conservative red wave in the rural areas. Here’s Westneat’s take.Here’s a quick look at how the night unfolded in Washington state. For a complete look at the numbers, visit our 2018 election results page. 8th District: With about 196,000 votes counted, Democrat Kim Schrier opened up a lead over Republican Dino Rossi on Tuesday night. The race is still too close to call. Here’s the latest on Washington’s hard-fought and historically expensive 8th Congressional District race. 3rd and 5th districts: Republican members of Congress in Eastern and Southwest Washington led their Democratic challengers. Rep. Cathy McMorris Rodgers defeated Democrat Lisa Brown and Rep. Jamie Herrera Beutler led Democrat Carolyn Long, 52 percent to 48 percent. Carbon fee: Voters rejected Initiative 1631’s fees on greenhouse-gas polluters. Taxes on sodas and groceries: Initiative 1634 to block Washington cities from enacting new food and beverage taxes was striking a sweet note with voters. It lead by nearly 10 percentage points Tuesday night. Guns: Voters gave a resounding yes to Initiative 1639, which will impose some of the nation’s strictest gun regulations. Police use of force: Voters approved Initiative I-940, removing a barrier that had made it virtually impossible to bring criminal charges against police officers believed to have wrongfully used deadly force. Seattle education levy: Students from preschool to community college got a boost as voters approved the $600 million-plus levy. State Supreme Court: Incumbent Justice Steven González overcame a challenge from attorney Nathan Choi. King County Prosecutor: King County Prosecutor Dan Satterberg won an easy re-election victory with about 72 percent of the vote. With several races undecided, check back for updates at Seattletimes.com. Sean Quinton: 206-652-6188 or squinton@seattletimes.com; on Twitter: @quinton_sean. Sean Quinton is the metro producer for The Seattle Times. Stacey Abrams, left, and Brian Kemp. (Photos: John Amis/AP) WASHINGTON — Republican Brian Kemp claimed victory Wednesday afternoon in the Georgia governor’s race, but Democrat Stacey Abrams said not all votes have been counted and announced a legal team that will fight to prolong the contest. WASHINGTON — Republican Brian Kemp claimed victory Wednesday afternoon in the Georgia governor’s race, but Democrat Stacey Abrams said not all votes have been counted and announced a legal team that will fight to prolong the contest.Abrams’s campaign manager, Lauren Groh-Wargo, called the process “a severe injustice” and said they were forming a legal team to prevent Kemp from moving forward.Central to Abrams’s complaint is the fact that not only is Kemp a candidate for governor, as Georgia’s secretary of state he’s also the government official in charge of overseeing the reporting of election results.Kemp claimed Wednesday that he had won the race, but the Abrams campaign said it was ludicrous to allow him to do so without releasing any evidence that all votes have been counted.“This election is over. The votes have been counted,” Kemp adviser Austin Chambers said on a conference call. “And the results are clear: Brian Kemp is the governor-elect.”The Abrams campaign soon held their own conference call with reporters.“They are trying to force an outcome … without offering proof,” Groh-Wargo said.Groh-Wargo said they have their own estimate of how many votes remain outstanding but weren’t ready to release it. Kemp’s secretary of state officepegged the total of outstanding provisional ballots at 22,000, and the number of uncounted absentee ballots at 3,000. Groh-Wargo said the Abrams campaign also believes there are “potentially large numbers of absentee ballots” that have yet to be counted. The Latest: Polish leaders to hold Independence Day march Associated Press• November 7, 2018 A worker cleans a statue depicting late Polish President Lech Kaczynski after it was installed at a central square in Warsaw, Poland, Wednesday Nov. 7, 2018. Kaczynski, who was killed in a 2010 plane crash in Russia, was the twin brother of Jaroslaw Kaczynski, the head of the current ruling party, Law and Justice. The statue will be official unveiled on Saturday as part of the centennial observances marking 100 years of Polish independence. (AP Photo/Czarek Sokolowski)WARSAW, Poland (AP) — The Latest on independence commemorations planned in Poland (all times local):6:15 p.m.A Polish official says the president and the prime minister are organizing a march at which all Poles can join together Sunday to mark the centennial of Polish Independence.The announcement of the state event comes after the Warsaw city mayor earlier in the day banned a march by radical nationalists that has marred Poland’s international reputation in the past and proven deeply divisive at home.Blazej Spychalski, a spokesman for President Andrzej Duda, said the president and Prime Minister Mateusz Morawiecki decided to hold the march after consulting with war veterans.He invited all Poles to march with the national flags Sunday to show that „we are one white-and-red team,” a reference to the national colors.Poland became independent on Nov. 11, 1918, at the end of World War I._2:25 p.m.The mayor of Warsaw is banning a march that radical Polish nationalists had planned for Sunday to coincide with Poland’s Independence Day.Mayor Hanna Gronkiewicz-Waltz said Wednesday her decision is meant to end the „aggressive nationalism” that has been a feature of far-right events for the past decade on the November 11 national holiday.A similar move was taken in the western Polish city of Wroclaw on Tuesday.The bans come amid signals that radical far-right groups planned to travel to Poland for the day and as police have staged mass walk-outs that raised security concerns.This year, Poland is celebrating the centenary of its independence, gained in 1918 at the end of World War I._12:35 p.m.A monument to the late President Lech Kaczynski has been installed in a central Warsaw square ahead of its unveiling as part of celebrations marking Poland’s 100 years of independence.Kaczynski, who was killed in a 2010 plane crash in Russia, was the twin brother of Jaroslaw Kaczynski, the head of the current ruling party, Law and Justice.Plans for the statue have been a point of political contention, with the city authorities — in the hands of the political opposition — opposed to the statue, and the provincial authorities in favor.The bronze statue will be unveiled Saturday evening ahead of centennial commemorations on Sunday. Poland regained its independence at the end of World War I after more than a century of rule by foreign powers. Investigators looking into the cause of the Lion Air crash, which killed all 189 passengers and crew, have identified a potential failure of a sensor that tells the pilot and the flight control computer the airplane’s “angle of attack,” which is the angle between the wing of the plane and the flow of air it is moving through.A plane will have a high angle of attack when climbing. Too high an angle would cause a stall.The concern caused by the flight pattern and initial investigation of the Indonesian crash is that the sensor may potentially feed false information about this angle to the flight computer, which in turn triggers other errors.In particular, with the sensor falsely indicating that the nose is too high, when it isn’t, it causes an automatic system response that “trims” the horizontal tail of the plane to begin putting the plane’s nose down.At the same time, it causes an indicator of the minimum speed to tell the pilot that the plane is near a stall, which also causes the pilot’s control column to shake as a warning. And the airspeed indicators on both sides of the flight deck disagree.The pilots can use extra force to correct the nose down trim, but the failure condition repeats itself, so that the nose-down push begins again 10 seconds after correcting.“If the nose is trimmed down on an aircraft, it becomes difficult for the crew to hold it,” said the person briefed on Boeing’s bulletin. “The nose is turning itself down and they are having to fight it. It takes a lot of effort to keep it from diving. Especially if you have a crew that’s confused and doesn’t know what’s going on.”This description fits exactly the flight pattern of the Lion Air jet that crashed.For 12 minutes before it crashed, the altitude swung up and down as if the pilots were fighting to maintain height, bringing the plane up, then having it swing down again repeatedly.Boeing statement on service bulletin On its website late Tuesday, Boeing issued this statement:”Boeing is providing support and technical assistance to the Indonesian National Transportation Safety Committee and other government authorities responsible for the investigation into Lion Air flight 610.The Indonesian National Transportation Safety Committee has indicated that Lion Air flight 610 experienced erroneous input from one of its AOA (Angle of Attack) sensors.Whenever appropriate, Boeing, as part of its usual processes, issues bulletins or makes recommendations regarding the operation of its aircraft.On November 6, 2018, Boeing issued an Operations Manual Bulletin (OMB) directing operators to existing flight crew procedures to address circumstances where there is erroneous input from an AOA sensor.The investigation into Lion Air flight 610 is ongoing and Boeing continues to cooperate fully and provide technical assistance at the request and under the direction of government authorities investigating the accident.”[RELATED: Boeing 737 crashed in Indonesia after key sensor replaced] Pilots are typically trained on how to handle a “runaway trim” situation, said the person briefed on the Boeing bulletin, but that’s with everything else working as it should. In this case, the control-column shaking, the stall warning and the air-speed-indicator disagreement all combine to create confusion and keep the pilots very busy.Boeing instructs pilots in the bulletin that if this failure arises, “initially, higher control forces may be needed to overcome any nose-down stabilizer trim.” The instructions go on to say that after the initial stabilization, the automatic trim system on the horizontal tail should be switched off and any trim performed manually.Pilots can turn off the automatic trim system with a cutoff switch operated by the thumb on the central control stand between the two pilots.“This is all coming from the Indonesian crash,” said the person briefed on the Boeing bulletin. “I’m not aware of any other operator having this problem.”More than 200 MAXs are in service around the world. 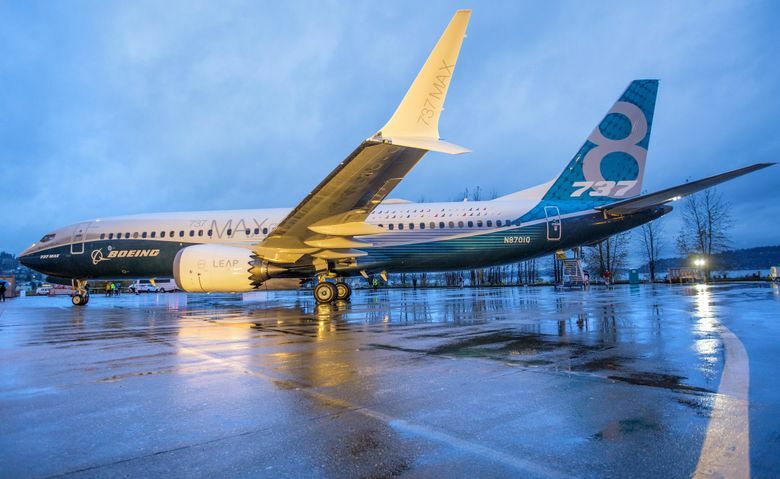 Boeing builds the 737 in Renton, and expects 40 to 45 percent of those built this year to be MAXs, the rest being the previous model.News of the service bulletin was first reported Tuesday evening by Bloomberg News. A Boeing spokesman declined to comment.Dominic Gates: 206-464-2963 or dgates@seattletimes.com; on Twitter: @dominicgates.